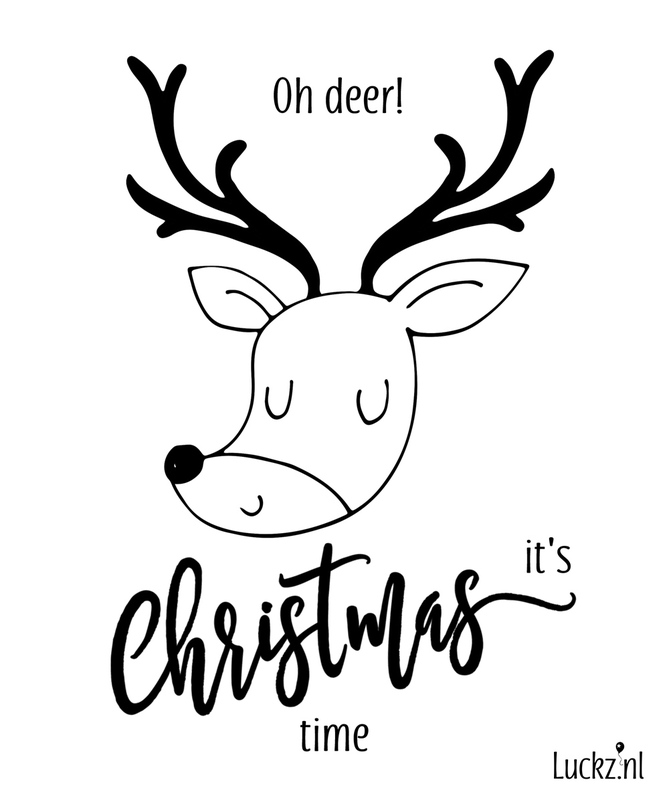 Zoek je een originele Engelse kerstwens of tekst voor je kerstkaart? Bekijk hier een mega grote verzameling van pakkende en originele Engelstalige kerst teksten. Kerstkaarten met een Engelse tekst zien er vaak heel mooi uit. 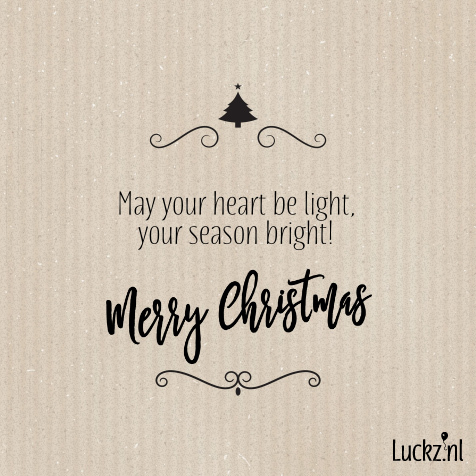 Probeer de onderstaande Engelse kerstgedichten, teksten, oneliners, versjes, gedichtjes en quotes uit op een van de kerstkaarten van Luckz en verstuur ze per post naar al je vrienden. A brand New Year is about to begin. Hope you are ready for more great experiences! A Beary Merry Christmas and happy New Year! A glowing star to lead the way. A baby sleeps as others watch and pray. A gift of hope is my wish for you. Spread the Christmas love and cheer! wishing you peace at the holidays and always! All I want for Christmas is you, my dear. May we celebrate this holiday together holding each other’s hand year after year. 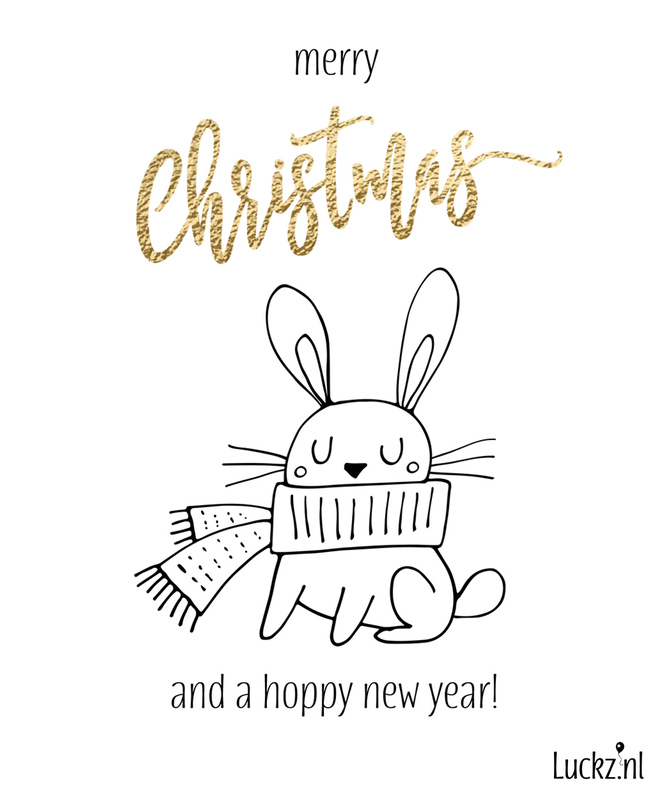 [ company name ] wishes you a Merry Christmas and a Successful 2019. I want to take time to tell you how blessed I feel to have you as a friend. We all make such a fuss. From our one special miss. this is how the holiday starts. hope and wonder of the season. Christmas time; When people want their pasts forgotten and their presents remembered! Enjoy the magic of the season and carry it into the New Year! Even when we’re far apart, the magic of the season will keep us together. 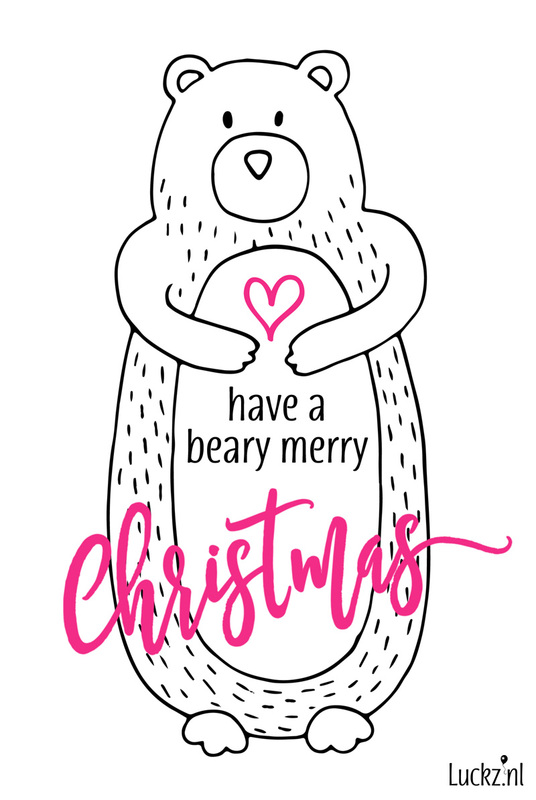 Have a Beary Merry Christmas and Happy New Year! Here’s wishing you a Christmas day full of joy and laughter. May love, success, luck and friendship come knocking at your door throughout this Christmas season. I already have the Christmas tree. What would make it complete? May this Christmas bring you comfort, joy, peace and happiness to last throughout the coming year! I wish you a Zen Christmas, I offer you the gift of nothingness. I wish you the love of family and friends. It's Not What You Spend At Christmas, It’s Who You Spend It With. but sharing it with others is even better. return to you on Christmas Day! May all your dreams come true. Wishing you a Happy New Year filled with tons of good luck! wrapped in joy and love. the strength never to give up. all that you wish for this Christmas. a very Happy and Joyous Christmas. your heart with love, your life with laughter. throughout the holidays and the upcoming New Year. May the spirit of Christmas be with you throughout the New Year! May the wonder of that first Christmas be with you always! May your Christmas be filled with joyful noise. may the new year bring all that is dear to your heart. May your heart be warmed by the sweet magic that Christmas always brings, and may all your dreams be fulfilled. Wishing you a Merry Christmas! May your New Year be filled with joy, health and success. My dear friend, I’m wishing you all the blessings of a wonderful Christmastime and I hope you feel all the joy this holiday season has to offer. New Year marks a new beginning. New people to meet, new goals and new memories to create. Here’s wishing you the Happiest New Year ever! not in what you get. Shine on us and make me proud. We're singing our songs and oh so loud! Sing we all merrily Christmas is here, The day that we love best Of the days in the year. brings the only Christmas Day. in the things you do and say. all the whole year through. through a Happy New Year. Of the days in the year. May these be yours at Christmas. There are so many gifts I want to give to you this Christmas. Peace, love, joy, happiness are all presents I am sending your way. There is no time more fitting to say “Thank You” and to wish you a year of health, happiness and prosperity. Thinking of you fills our hearts with joy at Christmas time. This Christmas season may we open our hearts to all people and to God. To quote John Lennon, “Happy New Year, let’s hope it’s a good one, without any fear!” Wishing you a magical New Year, with love from all of us! Twinkle Twinkle little star. You’re so bright and oh so far! Shine on us and make me proud. We’re singing our songs and oh so loud! We hope you’re ready for another big year. Wishing you great success and happiness in 2019! Days bearing peace, friendship and joy. Don't be afraid. It's because I told Santa I want you for Christmas. Wishing [ you/your family ] peace, love, and joy at Christmas and always. We hope it brings you lots of joy and happiness. Wishing you a happy New Year. May it be all that you hope it will be! All the best. and the love of Christmas! You don't need Visa when you got Santa! You've been naughty so here's the scoop. You're getting nothing but snowman poop!